If you are having a business function it is very important that you choose a DJ that has a professional image to entertain your important clients or potential new customers. It is also important to reward your staff with a fantastic day or night out. 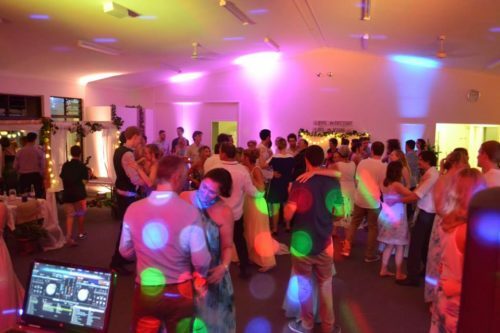 Whatever the occasion we are help to help with your DJ entertainment needs whether it be for a small business function or corporate promotional event. Please feel free to discuss any ideas that you may have to make your event leave a positive impression on all those that attend. Free travel from Postcode 4551 Caloundra up to 60km (covering Tewantin to Bribie Island & Maleny Hinterland radius. UP to 8 LED mood Light / Up lights set to any colour your request to highlight the walls in your function room. These lights set the tone & colour scheme of your event. They require no power leads as they have a built in lithium battery lasting up to 20 hours. They can later be swithed to automatic to show a mixuure of colours or beat with the dance music. PRICE $150. A Spectacular cloud machine for the your event. This is amazing to have your guests dancing on a cloud to their special song during the highlight of your event or used during a product launch. It is completley safe as it is a mixture of water, ice & heat to form a thick cloud. PRICE $200. Book both Mood Lighting / LED up lights & the cloud machine & save $50. TOTAL PRICE $300.